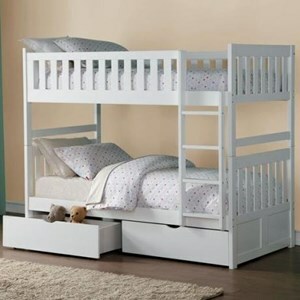 The fun space saving design of this twin bunk bed will make a wonderful addition to your child's bedroom. Built-in ladders on each side offer convenience, while full length guard rails provide security. 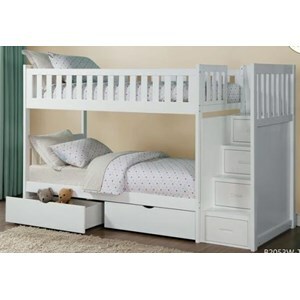 The Metal Beds Twin Over Twin Bunk Bed with Built-In Ladders by Coaster at Beck's Furniture in the Sacramento, Rancho Cordova, Roseville, California area. Product availability may vary. Contact us for the most current availability on this product. Finish Lead free, epoxy powder coat finish that resists scratching or chipping, with high gloss finish. Case Detail Smooth clean edges and straight rounded legs. Bunk Bed Construction Frame is reinforced with welded braces. Full length guard rails on all sides of top bunks and built-in side ladders. This bunk bed collection features fun and inviting designs that will add cheerful character to your child's bedroom. This collection offers a number of different styled bunks that include full length guard rails for security and built-in ladders for convenience. The Metal Beds collection is a great option if you are looking for Casual furniture in the Sacramento, Rancho Cordova, Roseville, California area. Browse other items in the Metal Beds collection from Beck's Furniture in the Sacramento, Rancho Cordova, Roseville, California area.